DURING the Prince of Wales’ two decades promoting “bridges of understanding with Islam”, advocates for suffering Christians tore their hair out with frustration. Did not the future head of the national religion get it? He made this remark last month, when he was the main guest at a ‘Service to celebrate the contribution of Christians in the Middle East’, offering a ‘Reflection’ from the pulpit of the nation’s shrine, Westminster Abbey right next door to Parliament, after the opening prayer. It was not until relatively recently that, following intense efforts to gain his attention, the Prince began to get a truer picture. In 2013 he made his first, somewhat halting speech on persecution, on the stairs of Clarence House, his London residence, in the company of controversial Prince Ghazi of Jordan and those clerics who had persevered in trying to educate him, particularly Canon Patrick Sookhdeo. A spokesman for Aid to the Church in Need, John Pontifex, described the Westminster event which the charity helped organize as “unprecedented”. “This was the Establishment recognizing the degree to which the persecution of Christians and other factors together mean we are facing a potential wipe-out of Christians in parts of the Middle East. “This is no longer a fringe interest of the few. It has now become orthodox to recognize that at a very high level,” Pontifex said. Prince Charles now meets regularly with the diaspora churches to hear their stories of loss and displacement. He said how humbled their ‘grace and forgiveness’ made him. Despite it, he still believes the past in the Middle East is characterized by ‘co-existence’. “In these lands which are the cradle of faith for Jews, Muslims and Christians, communities of different beliefs have shown that it is possible to live side by side as neighbours and friends. “Indeed, I know that in Lebanon Muslims join Christians at the Shrine of our Lady of Lebanon to honour her together. And I know that there are Muslim faith leaders who have spoken out in defence of Christian communities and of their contribution to the region. Revd Dr Mark Durie, an Anglican priest and Melbourne-based Qur’anic linguistics expert, has little time for the Prince’s politesse. “The Prince of Wales has made a profoundly misleading assertion. In fact the opposite is true: Christians in the Middle East have known centuries of inequality, oppression, marginalization and martyrdom. The current exodus of Christians from their ancient homelands is not an aberration, but merely the latest episode along the bitter trajectory of decline under Muslim dominance,” said Durie. “The Qur’an does not portray a God who expects people to care for one another. Rather it calls for believers to dissociate themselves from disbelievers in Islam, and to direct enmity against them,” he continued. Prince Charles, who will succeed his mother Queen Elizabeth II to the English, Scottish and Welsh thrones on her death, and who has already taken up her role as Head of the Commonwealth of former nations of the British Empire, has said he wants to be ‘head of faith’ in Britain, not just the Church of England. John Pontifex at ACN said that he could not be drawn into comment on the scriptural sources of oppression. Dr Durie, however, lays the problem of persecution at the door of the Qur’an itself, which repeatedly commends [Mohammad] as the “best example” to follow. Only by tackling what the Qur’an says about Muhammad’s example will the persecution stop, he says. 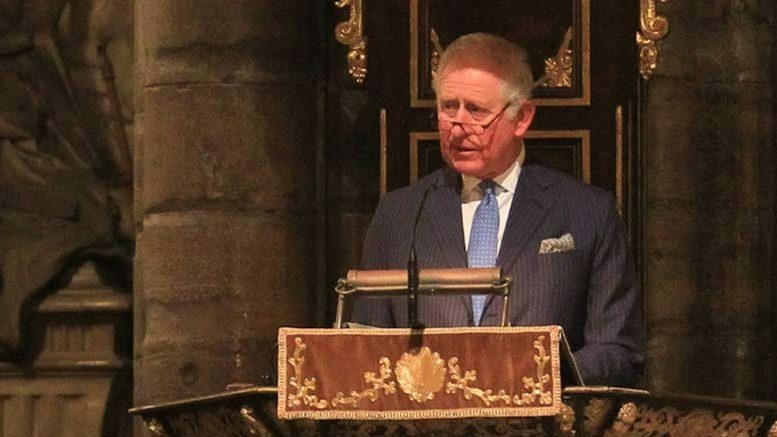 Caption: ‘Profoundly misleading.’ HRH Prince Charles addresses the Establishment on Christian persecution at Westminster Abbey. NOTE: The Westminster event was attended by Establishment figures, including the Archbishop of Canterbury, Rt Hon. Justin Welby, leaders of 13 Middle East churches, the Chancellor of the Duchy of Lancaster and Cabinet Office Minister David Lidington MP, and members of the Diplomatic Corps. Abbey personnel, with three persecution charities, Aid to the Church in Need, Embrace, and Open Doors, organized the Westminster service. It was attended by leaders of many of the world’s most ancient churches, including the new Archbishop of the Coptic Church in London, Bishop Angaelos, and His Beatitude Theophilos III, Patriarch of Jerusalem, had walk-on parts and ethnic choirs sang. JENNY JAMES TAYLOR is a journalist and writer and was appointed Research Fellow in Communication, Media and Journalism at the Kirby Laing Institute in Cambridge in 2019. A Bloomsbury author and campaigner she pioneered religious literacy in journalism, founding Lapido Media in 2005 as a publicly subscribed online newspaper and publishing house. Described by historian Tom Holland as 'groundbreaking', it helped to change the national secular discourse by providing resources for journalists needing to ‘get religion’ in an age of globalization. Widely travelled, Taylor has a doctorate in religion from the School of Oriental and African Studies, and has been published many times in academic journals and the mainstream and on-line media including the Guardian, the Times and, in translation, the European press. 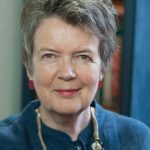 Her books include Faith and Power: Christianity and Islam in ‘Secular’ Britain with Lesslie Newbigin and Lamin Sanneh (SPCK 1998 and Wipf&Stock 2005) and A Wild Constraint (Continuum 2008). An Associate of the Community of St Mary the Virgin, she lives in community in London and Suffolk.